Key West is an island community, two miles by four miles wide, at the very end of the road. Most people get around on bicycle or foot, and the neighborhoods are compact and filled with lush gardens and tropical plant life. There are Cuban groceries and café con leche on every other corner, and a mix of Latin and Caribbean influences everywhere. Known for blue skies, open water and mangrove islands, and 80 degree days in winter, Key West is removed from the American mainland by 120 miles of bridges and small islands. Long a home to artists and creative people, the ghosts of Hemingway, Robert Frost, Elizabeth Bishop, Mario Sanchez, and Shel Silverstein still haunt our Old Town neighborhood. Flowers bloom year-round, and fruit trees proliferate. And on any given day, it’s not unusual to run into modern-day creative people, such as Judy Blume, Billy Collins, Jimmy Buffett, Meg Cabot, Terrence McNally, John Martini, Seward Johnson, or Annie Dillard. 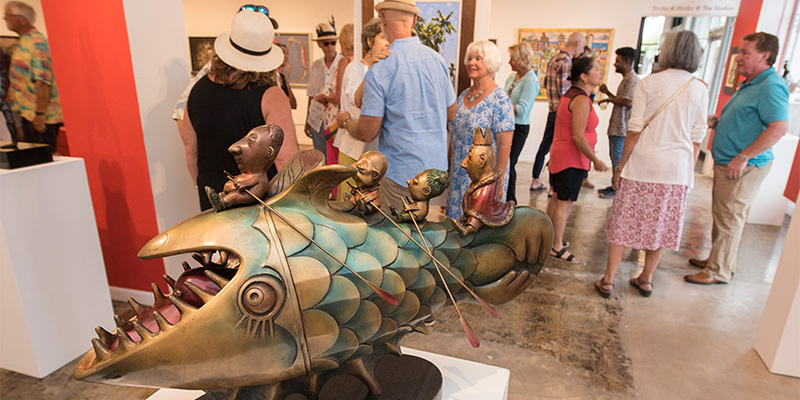 For a small community, Key West is rich in cultural events, creative projects, and celebrations of every kind. The population is diverse and compassionate, and takes to heart the island’s famous motto: One Human Family, which reflects The Studios’ commitment to living together as caring, sharing neighbors dedicated to making our home as close to paradise as we can. Our creative community is proud of this special sense of place. We embrace an independence from the mainland, celebrate our tropical and Caribbean influences, and seek out artists and cultural leaders wanting to do the same—and gain the benefit of exile in the Conch Republic.